A beautiful cake for summer! Preheat the oven to 350 degrees F. Generously butter a 9-inch springform pan. Using an electric mixer, beat the butter in a large bowl until fluffy. Add the sugar and beat until blended. Beat in eggs 1 at a time, then the lemon juice and lemon zest. Beat in the flour until smooth. Spread the batter evenly in the prepared pan. 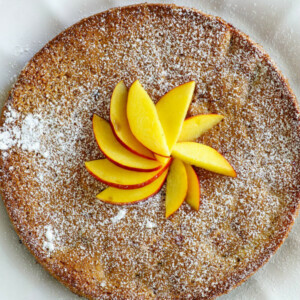 Arrange enough nectarine slices atop batter in concentric circles to cover completely; press lightly to adhere. For the topping, mix the cinnamon and sugar in a small bowl. Sprinkle over the cake. Bake until the cake is golden brown and a tester inserted into the center comes out clean, 40 minutes to 1 hour. Cut around the cake to loosen; remove the pan sides. *This can also be made with white nectarines, or about six large plums or pluots. If using plums or pluots, the baking time should be reduced to 30 to 40 minutes. *It's terrific served with whipped cream or ice cream.